After arriving at Havana Airport, which might involve a bit of a wait until there’s an empty gate for your plane, you’ll take a quick stroll over to the dimly lit immigration area. I waited in line at immigration for a few minutes, handed over my passport and about 45 seconds later I was done. No questions were asked, they took a quick photo of me and then they stamped my passport. The next step was a security check (yes, even when arriving) – the standard conveyor belt x-ray for your bags that you find at every airport. This only took a few minutes and then we went to collect our luggage from the luggage carousel, which also didn’t take long at all. From here, we walked through the customs inspection in about five seconds and ended up in the Arrivals Hall right after. So far, a very easy process. Entering the Arrivals Hall, however, is when you receive the reality check of traveling to a country that has little to no tourism infrastructure. The first thing I did was to visit the lone “Information Desk” but all the woman tried to do was set me up with a sketchy taxi driver. I gave up on that option and decided to go outside. Well, there I stood outside, with my friends, with no clue at all what to do in order to get to where we needed to go – the Vedado neighborhood of Havana. We gathered together. We politely brushed off those who approached us with offers that we couldn’t yet quite understand or figure out if they were real. As I write about often, the first thing a traveler should do when they arrive in a new, unfamiliar land – whether by plane, train, bus, foot or any other method – is to stop for 20 minutes. Find a quiet corner, take a seat and relax. Stay calm, be patient and observe everything around you, until you calmly figure out what’s going on and what you need to do in order to get to your destination. This helps you avoid rushing into a decision that could become a bad one. And that’s what we did, and before long, we started to make sense of this airport arrival scene and began putting together a plan on how to get to the guesthouse that we had booked. Before going outside, take the stairs to the second floor of the Arrivals Hall. This will instantly make arriving at Havana Airport much easier. Up here it’s super quiet, there are bathrooms and there is actually a helpful information desk, a money exchange office without any line (the exchange offices outside have long lines) and even an ATM. Take a breather up here for a few moments and change some money. I changed $40 USD and received 36 CUC (the Cuban Convertible Pesos that foreigners must use – the exchange rate is about .89 CUC = $1 USD). All kinds of people will approach you inside and outside of the airport asking if you want a taxi but it’s confusing because you have no idea what they’re really up to. The best option is to go back downstairs, walk out of the main exit and turn left. Keep walking for about 1 minute until you see a collection of yellow taxis. Here you will find a taxi dispatcher (I use this term informally because it’s just a man or woman yelling out ‘taxis!, taxis!’ in front of these yellow cabs). Approach this person and he or she will ask where you’re headed and then they’ll get one of the taxis to pull up to the curb. Before getting into the taxi, you’ll tell the dispatcher and/or driver where you’re headed and they will give you a price. The woman at the helpful information desk on the 2nd floor of the Arrivals Hall told us it should cost 30 CUC (about $33 USD) to get to our guesthouse and our driver’s first offer was 30 CUC. So we took it. If you’re headed to Vedado or Old Havana, the cost should be about 25 – 30 CUC. Make sure you agree on the price before starting the journey. There are meters in the yellow taxis but they are never used. At this point, once our journey into the city began, we simply assumed that it was going to be an interesting one, a ride full of surprises, maybe a sudden change in fare or bringing us somewhere we didn’t want to go. After piling into the somewhat beat-up minivan, the driver cranked up the reggaeton and off we zoomed at 140 kms/hour along near empty highways for 30 minutes or so. And just like that, we were right in front of the address we had given the driver. We paid the fare, he wished us a good afternoon and in the center of Havana we had arrived. That was it. Too easy. Once you navigate the chaos of the airport and actually make it into a taxi, it should be all good from there. 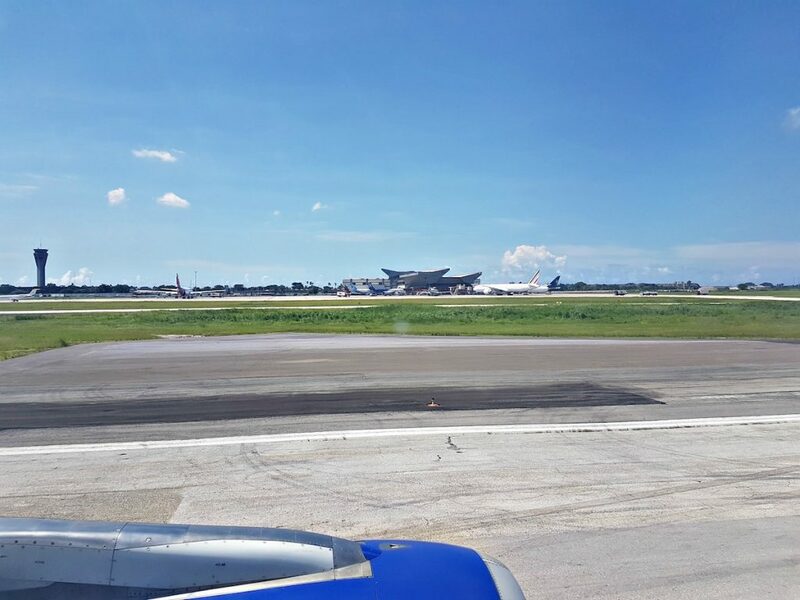 Arriving at Havana Airport is the challenging part and now you can just enjoy your first glimpse of Cuba and prepare yourself for a fascinating experience ahead. *Side note: At the end of our trip, we simply had our guesthouse owner order us a taxi on the phone to take us to the airport. The price was 25 CUC and it was a super smooth experience. Wherever you stay in Havana, they should be able to call one of these yellow taxis for you. Any questions? Please let me know in the comments and I’ll be happy to reply. Hi Al – Are there collectivos or regular taxis waiting at the HAVANA airport late night/early mornings? I arrive at 1 am. Thanks! We live Sunday to head to Havana/Varadero. 2: What do you know about Cell phone service in Cuba. some say to Buy Wi Fi and others say to get a SIM card..
ich will start my journey in Havanna for 3 weeks. I looked about informations for using WLAN in Cuba. One information was, that you need a SIM card from Etesca if you want to use the time-cards for hot spots. In all the other informations was nothing about this. Have you current information about this question? All your other informations for arriving in cuba was very helpful for me. Thank you. Hello! This article is great. Could you please share any insight on leaving the Havana airport and customs process. My friend and I have a trip August 1st and are wary with the new travel regulations. Any advice would be helpful. We made travel plans prior to the announcement. Hey Michelle – You check in for your flight, go through immigration and security and that’s it. Just like any other airport. How long is the total entry process to HAV? Im flying direct from Newark NJ. If no flight delays, how long is the immigration process to get out side to a taxi. Im bilingual so I dont anticipate issues, getting thru arrival hall to a taxi. Also, how long of a drive should I allow for, from Varadero Beach to HAV? Hey Noemi – It really depends on how many flights are arriving at the same time. When we landed, there were 2 flights and it took us about 45 minutes to go through immigration, security (you need to pass through on arrival), collect luggage and get outside. And I would allow at least 3 hours for the trip from the beach back to the airport. Hello, how is the ATM fee when taking cash out? Are there other ATM machines to use in the city of Havana? We didn’t see any other ATMs in the city but I think there is one at one of the higher end hotels if I remember correctly. As for the fees, it wasn’t too much, just a few dollars. This was really useful! I recently just went to Cuba and it can sometimes be very confusing! I wish i had something like this before I went to Cuba! I’m not sure what the maximum withdrawal amount is. Sorry! Im flying to cuba next month with my wife and daughter. We arrive in havana but we are staying in varadero so i was planning on just getting there first and finding a taxi there. Do u thing its a good idea ? What should i do ? Hey Cori – There are supposedly bus options but they seemed too complicated to try and take advantage of. Getting the taxi was the easiest way by far. Even if you take a bus, you’d then have to either transfer to a shared minivan to get closer to your accommodation or take a taxi once in the city center. Great information. I do have a question. I’ve navigated airports all over the world but mostly to developed countries. I’m flying to Cuba from MCO in April on Jet Blue and arriving three hours before my son and his wife arrive on their Jet Blue flight from FLL. My daughter-in-law is Cuban and advised that in Arrivals there will not be any place for me to sit and read a book while I wait. I can see that the airport Departures area in Terminal 3 appears to have restaurants and shops. Once I have collected my bags and gone through passport control is there anything to prevent me from going up a level to the Departures area to kill some time in a restaurant/bar or shop until my son and his wife arrive on their flight? Thank you. Hey Kate – There really isn’t anything in the airport at all, just one open restaurant really on the floor above the check-in hall. But you can definitely find a place to sit. Even after you proceed through customs, if you enter the arrivals hall (where everyone is waiting for passengers to arrive) and go up one level, there are places to sit right there. Hi I am in a similar situation. I will have around 6 hours to wait, Is there anything close by to do near the airport? is it safe to wonder around near there? and is there anywhere to leave luggage in the airport? Hey Katie – There isn’t anything around the airport within walking distance unfortunately. And I’m not sure about leaving luggage at the airport either. I didn’t see such a facility while there but I wasn’t looking for one either. Hope it works out for you! I will be going to Havana in a few weeks. This info in this article will come in handy. Thanks. Hey Derek…cool story, can’t wait to visit havana in a few months. Glad I know what to do at the airport thanks to this article so cheers for that. I absolutely love your writing style and was wondering what you read or studied to get your writing to what it is today. I know there probably isn’t any one answer but congrats. You’ve quickly become my favourite travel blogger! You said, “…they took a quick photo of me and then they stamped my passport.” I thought that they stamped a paper that you keep in your passport and which they collect upon your leaving. Is that not true? I tried to look into your writing history and I believe that you travel under a US passport. Hey Matt – Yes, I do travel under a US passport and at immigration you have the choice of having your tourist card stamped or your passport. I went for the passport. These days, as long as you fit under one of twelve categories, you are legally able to travel to Cuba with an American passport. Which of the twelve categories did you use? Hey Luke – I flew in from Mexico so you don’t need to fit into any categories if you go that route. It’s only the US government that came up with the categories for those wishing to fly there from the US. Hitchhiking in Cuba doesn’t work for tourist. Unless you are a local it’s illegal for anyone to pick up hitchhikers unless they are from Cuba. Also the locals must carry a hitchhiking license to pick up locals. Just a heads up 🙂 Happy travels! !